W.D. Pease has crafted an elegant Lock Back Folder with a 3-inch harpoon point blade of CPM 154 powder metallurgy high carbon stainless steel, 7 inches overall and 4 inches closed. 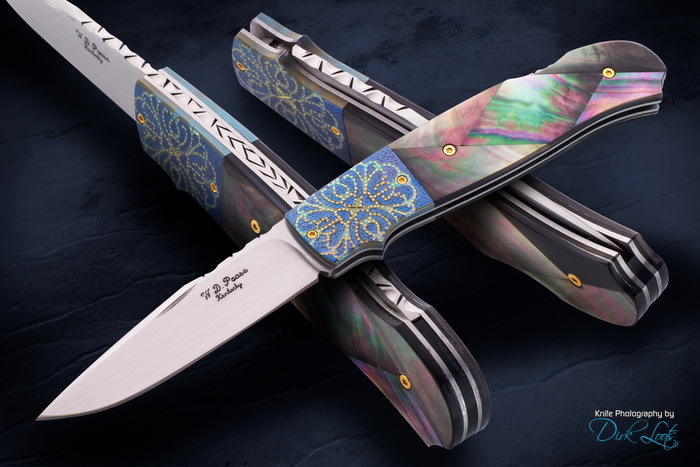 The handle is Black Lip Pearl mosaic with gold-plated screws, hand fileworked liners and lock bar and anodized and textured titanium bolsters.